Assassin's Creed IV: Black Flag. When fans of the well known Assassin's Creed series first heard this name, they were filled with mixed emotions. For the past few years, the AC series has had a new game release every fall, and fans had come to expect that; however, the fact that the newest entry was in fact "Assassin's Creed IV" was pretty shocking. Back when two was released, it had been a few year wait since the original game, and each game released after it was nothing more than an "expansion" of sorts. Brotherhood was the third title to be released (fifth if you count the Nintendo DS side game and the PSP side game), and it was actually a part of Assassin's Creed II. The game picked up right where two ended, and it carried the story a bit farther into the future; making way for yet another expansion to the AC2 story, a game called "Revelations" the following year. By the time Assassin's Creed III was announced, it had already been a few years since the release of two, and fans were expecting the pattern to be repeated. Judging by the past, it seemed that once three was released, we would be getting a few expansions to the game's story, which would then buy the developers time to bring out the next big title, AC4. Well, that wasn't the case. Not too long after the third "main" title was released, Assassin's Creed IV was announced, and to make things even more shocking; it was a game that had a sub title. Upon hearing that the next title would be in fact four, and hearing that it had the sub title "Black Flag," many fans became a bit concerned. The next major title was coming out only a year after the previous one, and up until this point the "expansion" games have all been smaller than the main title's adventure. 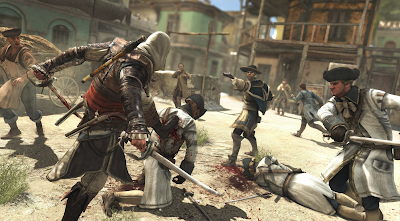 Assassin's Creed II was much longer than Brotherhood, and Revelations was nothing more than a "copy and paste" of Brotherhood, borrowing almost every aspect of its gameplay and story set up and placing it in a new setting. Sure, three was a larger adventure, but it had been in development for years along side other games, so most expected something big; however, four was something no one had ever heard of, and its announcement just seemed to come prematurely. Still, does that really show in the game? Is Black Flag really nothing more than a side game holding the way open for a future major title? Or could it actually be the largest Assassin's Creed adventure yet? Well, lets move onto the review and find out! When you first put in Assassin's Creed IV, and start up the story, you are thrown right into the adventure. The very first scene of the game shows two ships on the water, in all out war. On one ship you have a guy in a strange robe, while on the other, you have a man running toward the ship's helm. This man 's name is Edward Kenway, and he is a pirate, a pirate who is being attacked by an assassin. Once players take control of the helm of the ship, a short sea battle takes place. Cannon balls are flying, guns can be heard going off, and before long the battle turns into one of hand to hand combat. The battle may not last long, but it is an intense one; up until both ships are destroyed, and Edward is forced to swim ashore. Here is where he comes face to face with the assassin who attacked him, and it is the starting point of his journey. Unknown to Edward, this fateful meeting will change everything for him, and set not only his path in life, but also his future family's life (as seen in Assassin's Creed III). As he lies on the beach, Edward mocks the tired assassin in a happy go lucky way. "Was it as good for you as it was for me?" At this moment it becomes clear that unlike the previous entries in the series, Assassin's Creed IV is willing to have fun with the story. It isn't a game that tries to be serious, it is a game that truly embraces the pirate way of life; the devil may care, go where the wind blows you type of life style. Edward has fun even when his life is in danger, and he isn't going to let anyone stop him from living this way. He is a man who set out on winds of fortune, and now he has come face to face with the assassin order. 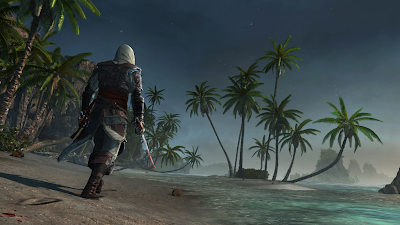 Here, on this island, Edward chases the assassin down, kills him, and takes his clothing; inside is a letter stating to meet with a governor, and that is what he decides to do. This governor has never seen the assassin's face before (a man we learn to be named Duncan), and because of that Edward decides to take on his name and role. The role of a run away assassin who has decided to join the governor's "Templar" faction. 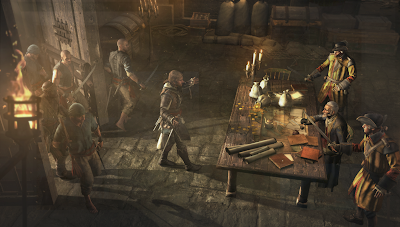 It seems that these templars have uncovered some sort of treasure, and Edward is determined to take it for himself. And so, begins his long journey. Soon, Edward will find himself face to face with the templars and their "evil" plans, he'll be captured and sent off in a ship he will then take for himself, he will build himself a pirate crew, and ultimately learn the ways of the assassin. Unlike previous games in the Assassin's Creed series, Assassin's Creed is massive, and a true open world experience. Up until now, most games have taken place in a few large cities, and they were normally connected with smaller paths between them. Sure, Assassin's Creed III did have some large open forest areas to explore, but even that was an overall enclosed experience. With four however, them walls have now been torn down, and you are completely free to go and do as you please; it is a true pirate adventure. Once you gain a ship an hour or so into the story, the world is your oyster. When controlling the ship you can control how wide the sails are open (which will catch the wind more and speed you up), you can steer the boat, you can order your crew to fire your canons (or any other weapons you may have), you can tell your crew to get down and brace for an impact, you can enter a faster sailing mode (which is even faster than full sails), you can salvage materials you see floating on the water, you can save people drifting at sea, and you can also let go of the helm and walk around the boat. To put it simply, you actually have full control over this ship, and you can use it to take you anywhere. The ocean in Assassin's Creed IV is basically a massive open sandbox world for you to explore. There are islands you can land on, there are other pirates who will attack you, you can attack ships and rob their crew, you can become wanted by the navy (who will then hunt you down), you can go hunting for sharks (which will activate a hunting mini game where you must harpoon them), you can pull up along side sunken ships and dive underwater to explore them, or you can just take your time and have fun exploring; it really is up to you. The game doesn't tell you what you have to do, and the waters are filled with activities for you to partake in. If you want to attack a navy ship, feel free to do so, if you want to land on a small island and hunt for treasure, then do it! Nothing is stopping you! This game is all about the freedom of being a pirate, and because of that it can tend to feel a bit more like a pirate simulation than an Assassin's Creed game, but that doesn't mean all of the Assassin's Creed feeling is gone; a lot of it still remains, and it is the good parts at that! Once you have landed on an island, or went to a larger city (which is a series staple), the game becomes quite a bit different. Here instead of having a massive open world to explore, you will find yourself in more enclosed areas. Sure these areas are large, and are still filled with things to do, but now you will actually see some boundaries. Some towns are built around cliffs, others may be found within the deep jungle, and some are just in open areas with either water or some kind of road block keeping you from exploring farther out. This really isn't an issue however, and you still will feel like you have complete freedom in the game. If you are spotted by guards as you run through a restricted area, then you will be pulled into combat. During combat the camera will zoom out a bit to give you a wider view of the area, and you are then free to attack as you see fit. By simply hitting the attack button you can pull off some basic combos to finish off the enemy in a realistic manner, but this on its own does not always work. Enemies will parry your attacks, and they will attack you at full force as well. By using your break guard attack, you can sometimes knock the enemy off balance and strike them, but sometimes even this is not an option; especially when you are being attacked yourself. 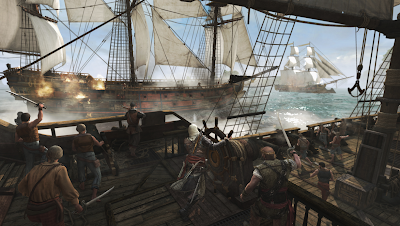 Overall the battle system in Assassin's Creed IV all comes down to watching the enemies' movements, and if done right it will result in some fast and fluid battles. Pressing the counter button the moment an enemy strikes you will result in you preforming a counter attack, one which may break another enemy's guard, tapping the attack button the moment an enemy lets down their guard will result in you landing a hit (or possibly killing them in one blow), and using the guard break the moment the enemy's guard is at the weakest will allow you to get your own attacks in for once. Each and every enemy has their own tells to tip you off on what you should do, and they can sometimes be easy or hard to spot depending on the skill of your foes... Although, the game will tell you if you're about to be shot, thanks to the "use as human shield" prompt popping up on screen which allows you to grab a nearby enemy to use as a shield. Although the combat in Assassin's Creed has never been truly challenging, it is very flashy, and can be very fun to watch. Even when going up against a pack of weak enemies, it never gets old watching Edward pull off fancy sword play, or watching him knock enemies off of the roof or slam their heads into the ground. Everything about the combat is stylish, and because of that you may find yourself getting into more and more fights. Still, there's more than one way to go about this, and there's more than one type of weapon to use as well. This time around, weapon switching is seamless. In Assassin's Creed III players had to hold down a button, bring up a menu, then fiddle around with it until they could select the weapon they wished to use. Well, that has all now changed, and we have returned to the style seen in the older titles (such as Assassin's Creed II). Now with the simple press of a button, you can freely switch between any of your weapons without slowing down the gameplay. While on consoles this action is mapped to the D-Pad with each of the four directions mapped to a different category of weapons, on the PC these buttons can be mapped however you like. If you want to get into a fist fight and then quickly switch over to your dual hidden blades (which are knives hidden on the underside of Edward's wrists), you can; if you want to start off using your hidden blades and then switch over to your dual swords, it is quick and easy to do so, and it does not slow down the game at all. Basically, Ubisoft has finally fixed just about every issue with the combat system from past games, and it is now fast and easy as it should be. A very much welcomed improvement. Despite combat being one of the main aspects of the game, it is also something which can be avoided if you want to. At its heart, Assassin's Creed is a stealth series, and because of that there are a wide selection of stealth options for you to preform. The hidden blade is there to pull off fast quiet kills, you can use your fists to choke people and knock them out, or you can even use your swords for a quick messy kill as well. As long as you are not spotted, Edward will pull off a stealth kill, and it is then up to you to decide what to do from there. You can pick up bodies to hide them, you can leave them to draw attention to that specific area (and away from you), or you could even hide (such as in tall grass), and use the whistle ability to call enemies over to kill them and hide their body all at the same time. How you go about being stealthy is up to you, and in Assassin's Creed IV the mechanic works better than it ever has. Sure at time guards will still spot you and not be smart enough to realize what you are doing, but for the most part guards are a bit more quick to react, and there's a lot more ways to be stealthy to get around them. From climbing on buildings, to sneaking through grass, to blending in with the towns people, to even throwing smoke bombs; there are a wide verity of actions to preform, and they all just feel great. You will never be spotted and feel like it was the game's fault, if you are not good enough to sneak past someone; it all comes down to your skill and not some cheap detection. Just like in every other Assassin's Creed game, four follows a linear story path, but it is also filled with a lot of side content. When it comes to the main story quests, Edward will find himself doing a wide verity of things. Sometimes he'll be asked to follow someone without being spotted, other times he'll need to kill someone, and once in awhile you'll even have to capture a fort or two at sea. The game does a very good job at mixing up the mission objectives, and you never really feel like you are doing the same thing twice. Now sure, you will be asked to take down a target at sea more than once, but each time you do repeat something, the game does change it up. While one sea target may be one you are simply asked to take down, another target may be one that you have to follow without being spotted, all while trying to avoid being sunk by a storm! Changes like these help keep the missions from becoming boring; which was actually something a few of the older games struggled with. This time around it seems Ubisoft finally realized they needed to keep the gameplay fresh to keep players interested, and they really did a good job of doing so. 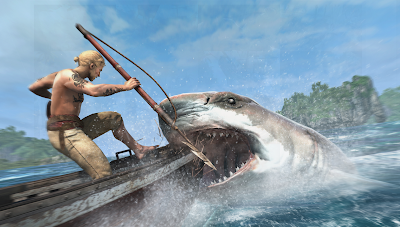 As you complete story missions in Assassin's Creed IV, there are extra objectives you can complete as well. While some story chapters do not have any "extra" goals, most of them do. Long time Assassin's Creed fans know that most of the series actually takes place in the past, a past where the main character in the modern day is using some sort of machine to look into. This character in the modern day is basically living the life of people from the past, sort of in the form of a video game. Just like you, the player, they have control over what this character does, but everything they make them do may not be how history truly played out; this is where the extra missions come into play. Now sure, you can complete a story chapter however you want, but you can also complete it how it actually happened in "history" as well. For example, in one story section Edward may have shot someone with his gun, then pushed another guard off the roof of a building. If you want to complete the chapter how it happened in history (and receive a 100% sync bonus which unlocks special content later), you can; however it is not required. You can completely ignore how history happened, and do things your way; it is up to you. While the story missions themselves are not extremely challenging, these side objects tend to be, and they will push your skills to the fullest. On top of story missions, there are side quests and collectible items as well. The game is loaded with treasure for you to find, and items to unlock extra content, but none of it actually has to be found, and you do not have to help the other people in the world either. If you want to help someone out you can, but you can also just focus on the game's main story as well. This is why these extra quests are called side quests, and they are not truly important to the story; however they do add to it. 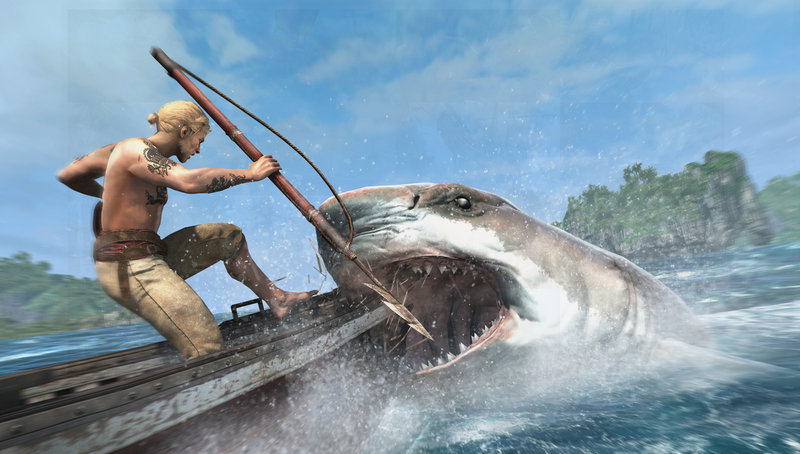 In Assassin's Creed IV, side quests come in a wide verity. There are assassination contracts which have you hunting down targets, there are sunken ships for you to explore, there are forts you can attack from sea and capture for yourself, there are people who will simply ask for your help (these missions vary from person to person), there are legendary treasures for you to hunt down, and the list just keeps going on and on. The game is filled with extra content, and chances are you'll find yourself caring more about it than the story itself. Each time you set sail to go to the next main island, you WILL get distracted by something else, and you WILL want to go check it out. After twenty or so hours of exploring the world and taking part in side content, you will then realize just how massive this game truly is... And that isn't even the half of it. Early on into the game, you get your ship, and a few hours later you get your very own island. While on the surface your ship is just something to get around in, and your island is just a place to call "home," in reality both serve a much greater purpose, and they have a lot more complex systems to go along with them as well. Both your ship and your island can actually be customized greatly, and they play key roles into your survival in this world. When it comes to your ship, you can buy and build new attachments for it, you can upgrade existing parts to make the ship stronger, and you can even buy parts to change how it looks; meanwhile on your island you can build new buildings (which will in return provide different perks to help you on your journey), and you can make your island grow larger in general. Customization of these sections of the game really play a major role, but they also take a lot of work to maintain as well. Just as you might have expected, nothing in this game is free, and resources do not come easy either. In order to get resources, and money, you actually have to go out and find it yourself. There are animals throughout the world which you can hunt for resources, there are materials you can find at sea, and there's also a lot of different ways you can earn money as well. All of these different types of resources are key when it comes to upgrading your ship and island, but that's not the only use for it either. Sure your ship and island are important, but outfitting Edward is key as well. If you don't buy the latest and greatest weapons from the shop, you might find yourself up the river without a paddle, and if you don't use resources to upgrade Edward's armor, or build him new equipment, you may still find yourself stuck between a rock and a hard place. You really have to play it safe, and really think about your next plan of action. Is that next ship upgrade really going to be worth it? Or should you save that money for some better weapons for the upcoming fights? It is up to you to decide, and it is just another way Assassin's Creed IV provides you with complete freedom. While these RPG like elements have been a part of Assassin's Creed since two, this time around they are better than ever. As I mentioned above, Assassin's Creed is a series where someone in the present day is using a machine to look into someone's life in the past, and four is no different... At least not in that aspect. Up until now, the game has mostly focused on a man named Desmond Miles, an assassin who ran away from "the farm" only to be captured by templars and forced to look into the past. After his escape in the second game, the modern day story has focused on the impending doom at the end of 2012 (which has now passed both in game and in reality), and each game featured more and more of a story on his part. Brotherhood featured a town for him to explore and ruin styled levels to make your way through, Revelations featured puzzle levels, and Assassin's Creed III had full modern day assassin "levels." Either way you look at it, Desmond's role evolved greatly with each game, and that is how many fans thought it would continue; however, it did not. This time around the main character in the modern day is an unseen character (due to these sections playing out from a first person point of view) who is meant to be "you." You are a newly hired employee at a company that deals with the entertainment business, and it is your job to look into the past at Edward's life to capture footage from it. It is a fun and easy job, and it seems like the perfect place to work. Well, at least that is what they want you to think. The truth is, this company is nothing but a bunch of templars; seeking to destroy the assassin's and meet their own goals. While the main character of the modern day does not know that, players who have played past entries in the series do. Although their goal is not clear this time around, it is very easy to tell that not everything is as it seems. After being asked to hack into someone's computer, and seeing an autopsy report, things start to take a turn. Slowly as you hack other computers (which is done so by playing mini puzzle games), and make your way throughout the story, the more you will understand, but until then, you will be left in the dark. Slowly the modern day evolves into a mystery story which you won't be able to wait to see come to an end. Especially if you've played past entries in the series and you see familiar faces working along side you. Ever since Assassin's Creed: Brotherhood, the series has always had a multiplayer element. 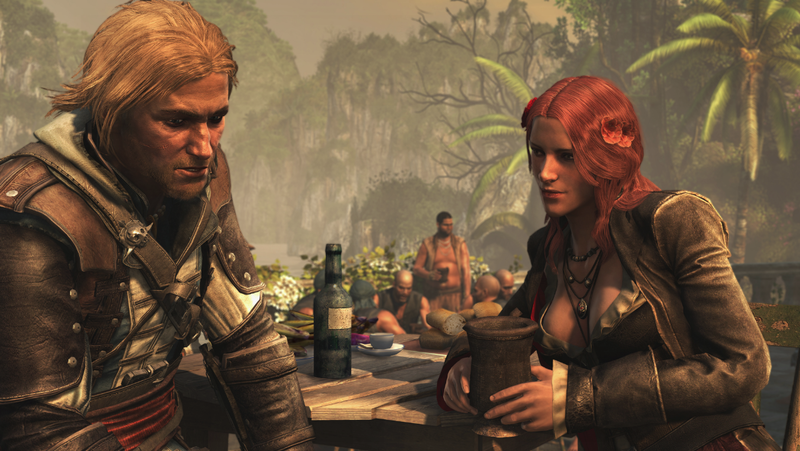 This multiplayer mode normally features a mini story mode (which normally tells more about the templars), and it is always based around the same sort of gameplay. 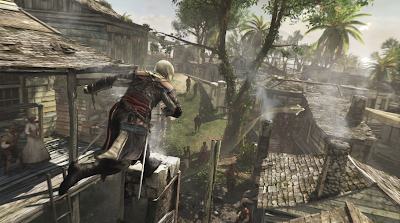 The multiplayer mode of Black Flag is no different. In the multiplayer players pick a character to play as, pick the perks/abilities they would like to use on the character, and they then enter a world where they must assassinate their targets, or complete other goals. Each level throws you into a mini open world city, and it is then up to you to figure out how to take out your target. Just about every single game mode follows the same concept, where you must hunt someone while trying to avoid being hunted yourself, and it really does take quite a bit of skill. While the city streets are filled with NPCs which look just like you, and every other player in the map, you must do what you can to blend in with them, and look for the real version of your target as well. It is a slower paced gameplay style, but nothing feels more rewarding than when you finally track down your target and go in for the kill. The better you do in this mode the more points you score, and the more points you score the more exp you gain. Once you have maxed out your exp, you will then gain a level, and over time you'll unlock more abilities to use. Overall the multiplayer mode isn't the main focus of the game, but it is a nice fun extra for you to kill time with. 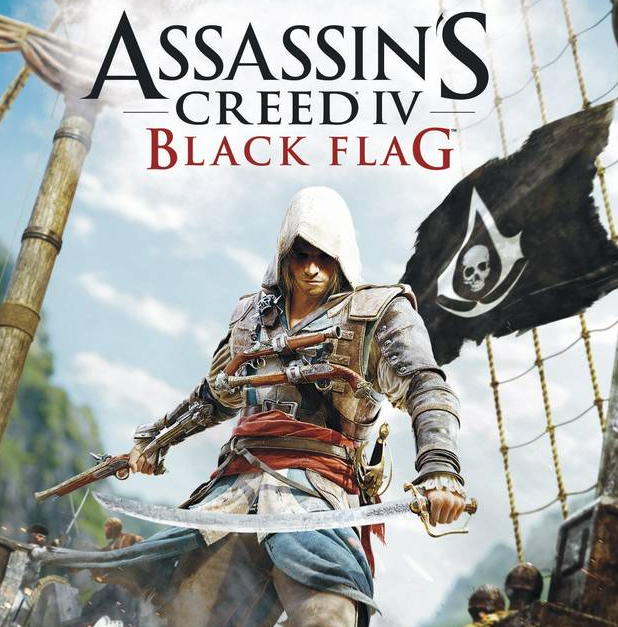 Assassin's Creed IV: Black Flag is the first game in the series to be released on 8th generation consoles, and because of that it does have some differences between the console releases. While the 7th generation console version of the game still plays the same, there are some very noticeable differences between it and the "next gen" version; however they are mostly cosmetic. The first major difference is the fact that the PS4 version of the game runs at 1080p while the other versions run at 720p. This on its own makes the game look a lot nicer, and it will prevent 1080p televisions from upscaling the game like most of us have become used to. The image now stays nice and sharp, the textures are extremely detailed, and the game becomes complete eye candy. Now sure, the other versions of the game look nice as well, but for anyone looking for something more; this gives you a reason to check out the next gen version. Although, this is not the major improvement, nor should it be the selling point. When you look at past Assassin's Creed games, they have always had some issues. The framerate would lag, the draw distance (how far you can see) sometimes felt short at times, towns people would magically just materialize in front of you (as well as grass and plants which would just grow out of the ground), and sometimes the loading screens just felt too long. Well, that has all been improved on now! Now sure, towns people will still pop in from time to time in the next gen versions, but it doesn't happen near as often, and the loading screens can sometimes still be long, but they are faster; however when it comes to the framerate and draw distance, they are a MAJOR improvement. The framerate never drops (or at least if it does you cannot notice it). The game runs extremely smooth, despite having much larger open areas, with highly detailed 3D models and textures. This is something most fans have wished for since the early games, and now Ubisoft has finally made it so. On top of that, the draw distance goes a lot farther as well. While at sea you may sometimes see fog in the distance to mask the limitations, while on islands you can actually see everything; from cliff wall to cliff wall. This helps make the game look a lot more realistic, and was a very much welcomed improvement as well. Still, one of the things that stand out the most about the game is actually its physics. The 8th generation version of the game has highly realistic physics. Now sure, they aren't dead on, and when Edward jumps he still feels like he is floating at times, but none of that matters. What really stands out about the game is actually the little details, and you will often find yourself stopping just to look at them; the water is a prime example of this. The water in the 8th gen version of Assassin's Creed IV is extremely realistic. The way the waves ripple through the water, the way the water washes up on the boat and stays, the way the rain blows in the wind, the way the storms knock your boat around, and so on. The game really makes you realize just how wild the ocean truly is, and it is very clear that Ubisoft put a lot of work into getting everything just right. While in the 7th generation console version things seem a bit more calmer, the next gen version really shows what a better physics engine can do. While it isn't an important detail, it is one that really stands out, and it makes sailing much more enjoyable believe it or not. 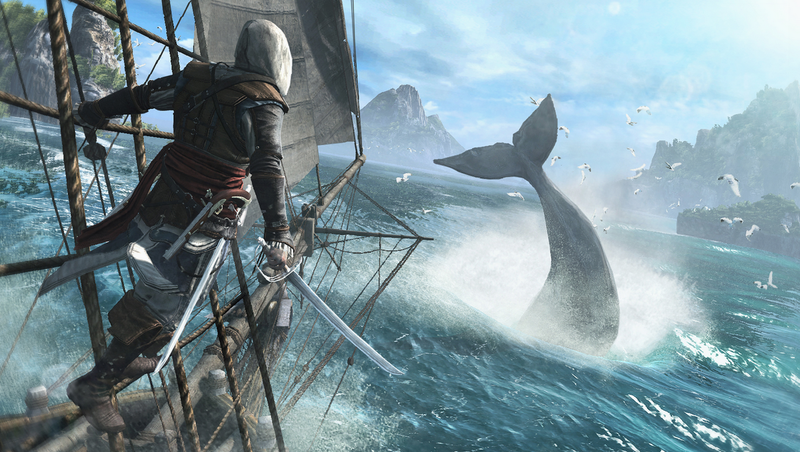 Assassin's Creed IV is a game fans should not miss out on. It takes just about every good point from the previous entries in the series, and throws them all together in one big massive adventure. Most of the issues and hang ups from the past games are gone, and that makes the game a whole lot more enjoyable in general. While Assassin's Creed III had about an eight or nine hour intro before the game got started, four throws you into the action from the get go, and it never slows down. You get a ship early on, which can be heavily customized, you get your own island early on, the world is massive and completely open, the story itself is great and will keep you hooked, there is a lot of side content, it has fun multiplayer, and the game looks amazing. 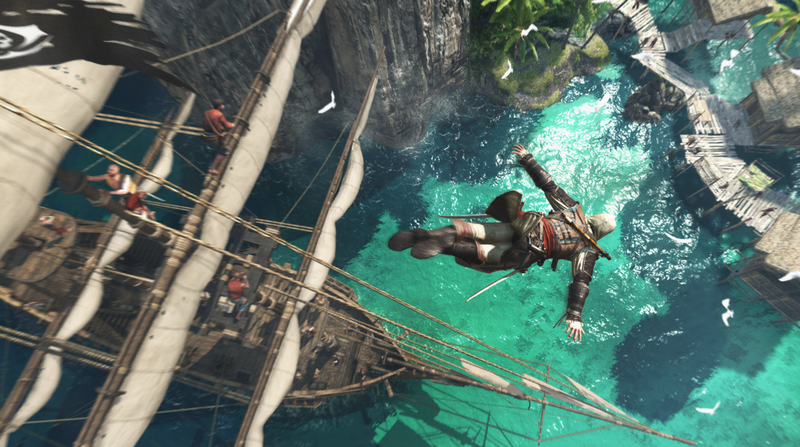 When it comes down to it, playing Assassin's Creed IV may ruin the previous entries in the series for you, or at least make it hard to go back to them. It was a major step forward in every way; so much that some may even feel this should have been Assassin's Creed III instead. Edward himself is a great character, and a lot of fun to play with. Overall, the game really doesn't have any true issues. Unless you're the type of person who doesn't enjoy this sort of game, there really isn't any reason you shouldn't get it. The technical issues seen in earlier games have been fixed due to the power of next gen, but even the 7th generation versions aren't held back by what little issues there are. This game is one that did everything right, and it just may become your new favorite entry in the series. If you have a 7th generation console and you're thinking about getting an 8th gen; you might as well wait, but it really doesn't matter. It is a great game no matter what console you play it on. This is why I am giving it a solid 10/10. Good job Ubisoft, you had me worried there for a moment!